A Calder Valley MP took to the “rotting” roof of a high school to protest against the lack of Government funding for new buildings. 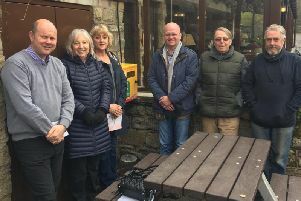 Craig Whittaker led campaigners around Todmorden High School today (Tuesday), to show them the extent of the deterioration of the facilities at the school. MP Craig Whittaker stages rooftop protest. For more on the story, see this week’s paper.